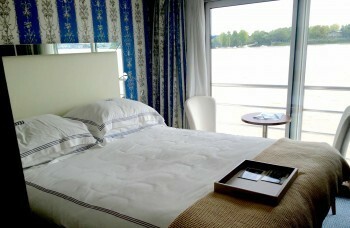 Bordeaux River Cruise —C’est Magnifique! As we embarked on an eight-day UniWorld boutique wine river cruise along the Garonne River, the Dordogne, and the Gironde Estuary, an area settled by the Romans and ruled by the English (but every bit a French region), we were about to taste some of the most celebrated wines of the world and to learn both about the history and the cultivation of a fascinating region. Sante′, a toast used by the French, to our upcoming voyage! The Garonne River is a chocolate color, which is created by the large, rapid fluctuations in turbulent velocities during the tidal bore—a tidal phenomenon in which the leading edge of the incoming tide forms a wave of water that travels up a river against the direction of the river current. We found out the first morning on the ship that this fluctuation requires the captain’s very precise navigational skills. A group of us trekked up onto the top deck to witness maneuvering at exactly the time of the lowest tide as the ship sailed through the arch of the Ponte de Pierre, a beautiful bridge built in 1819 consisting of 17 arches for the letters in the planner’s name, Napoleon Bonaparte. But let’s go back to the beginning of the trip. Just to get us in the mood and to offer us a chance to work on our French, we spent five days in Paris prior to this cruise. After those glorious days, we shuffled our suitcases from the Metro station to Charles de Galle Airport and then on to a fast train to Bordeaux. As promised, the UniWorld ship was docked in the heart of downtown Bordeaux waiting for us to board and enjoy a delicious luncheon smorgasbord before unpacking in our room. We would soon realize that the generous, gourmet lunch was typical of what we would experience the rest of the time onboard. After unpacking and relaxing following our trip to Bordeaux, we imbibed in the Cocktail of the Day along with the other 108 passengers onboard and chose a seat for dinner in the Le Bordelais Restaurant where we would soon learn of the various home cities and interesting backgrounds of our fellow travelers. We met South Africans, Brazilians and Canadians as well as fellow Americans from throughout our country. Several choices of appetizers, main courses, and desserts were offered—all spectacularly plated. 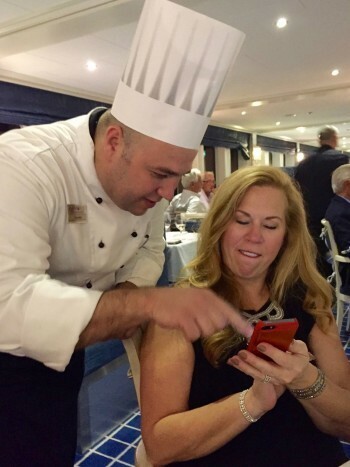 We were going to experience gastronomic delights each meal of this cruise. Many courses were specialties of the Southwestern French region where we were traveling, such as duck confit, oysters, and caviar d’Aquitaine, carefully prepared by French Chef Philippe Etchebest who was awarded two Michelin stars—one at Chateau de Reynats and a second at the Hostellerie de Plaisance in Saint-Emilion, France. He appears on French television in Cauchemar en Cuisine, the French-language version of Gordon Ramsay's Kitchen Nightmares. Oh, did I mention that each lunch and dinner was accompanied by both a red and a white Bordeaux from the local region. Dinner was followed by music and dancing in the Gascogne Lounge. Little did we know this evening of dancing and partying would set the stage for the rest of the trip. That evening we met what we fondly referred to as the “Alabama Contingency,” comprised of five couples who had cruised together before and welcomed us into their group. As many of you know, those Southerners love to party and dance, and we were not to be outdone. On Day 2, after breakfast with every imaginable taste treat, including gourmet cheeses, fresh fruit, pastries, cappuccinos, prepared to order omelets (and even two types of bacon—soft or crispy), we divided into groups on three buses, each with a separate tour guide, and set off on our first day to an artisanal lunch, served with wines from historic 1855 vines at Chateau D’Arche near Cadillac. We were in the Sauternes region of this area, home to that most famous of Sauternes, Chateaux d’Yquem, and looked forward to pairing savory as well as sweet dishes with Sauternes of this area. To make truly great Sauternes, we were told the wine must have good levels of Botrytis, the noble rot, causing the grape to partially shrivel like a raisin, showing concentration with a distinct flavor. 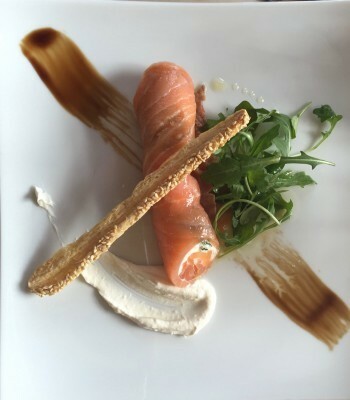 Our lunch began with ribbons of smoked salmon around a creamy center and horseradish emulsion elegantly presented alongside a Chateau La Bouade 2010, a pale golden wine with good acidity and spicy flavors as well as tastes of honey and peach. The next course arriving on our table was a caramelized hen with mushroom pastry and asparagus tips. Chateau Filhot Sauternes, my favorite of the three Sauternes tasted that day, reflected a concentrated flavor with a nicely balanced acidity that paired perfectly with the musty and gamey flavors of this course. A meal would not be complete without dessert, and a wine barrel stave held our dessert of roasted Peach Melba with crunchy praline, whipped cream and chocolate drizzle. Chateau Lamourette 2002 paired well with our dessert because of its light peach flavor and lasting taste. Since most Americans think of Sauternes as only being paired with desserts, this tasting provided much conversation about the various pairings. When you think about the fact that the Southern region of France was once ruled by the English who love all things sweet, you can understand why sweet wine grapes were originally planted in this area. These wines were exported to England from the shipping port of Bordeaux until the time when the reds of Bordeaux became the predominantly preferred wine of the region for exportation. On our drive, it was exciting to see from a distance the most famous of the Sauternes Chateaux, Chateaux d’Yquem. Day 3 of our trip found us on a Saint-Emilion walking tour. 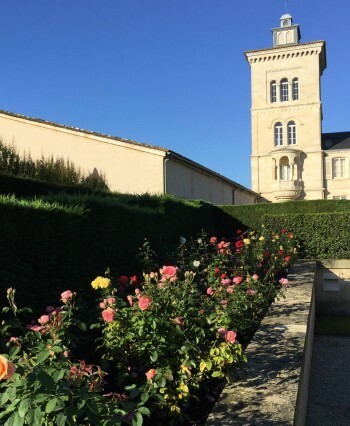 It is one of the prettiest of Bordeaux's wine towns, perched on top of the steep limestone slopes upon which many of the region's finest vineyards are situated. First on our list of stops was Saint-Emilion Church, the underground hermitage and monolithic church, so called because it is carved out of one piece of stone in the hillside. You enter the 12th century church in the cobbled street market square, and once you’re past the main door, you go down below the chapel where you find the hermitage, the original cave where a teenager named Emilion, fleeing the notoriety that accompanied miracles he had performed in Brittany, lived 1200 years ago. 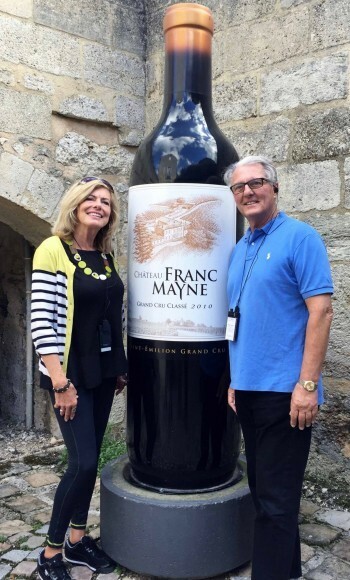 Our next stop was the cellar of a Premier Grand Cru estate, Chateau Franc Mayne, where we sampled the Grand Cru Classe 2011 as well as Les Cedres de Frac Mayne 2011 Grand Cru. 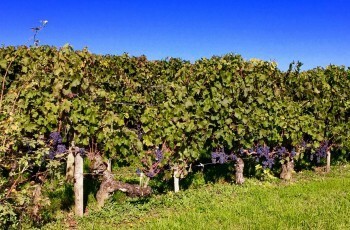 Typical of the Saint-Emilion area, the predominant grape varietal was Merlot. Both wines displayed medium tannins and were soft and rich on our palates. 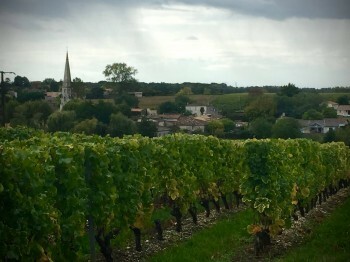 The Saint-Emilion area is on the Right Bank of the Gironde River. This area is known for Merlot and Cabernet Franc with Merlot being the dominantly produced grape. The soil of the Right Bank consists of limestone and clay, adding to the minerality and approachability of the wine as well as softer tannins. Before we left Saint-Emilion, we had to find a Macaron shop since Saint-Emilion is home to the original Macaron (natural colored with no filling). These were delicious, but I still prefer my Macarons in bright colors with delicious fillings. Back on the ship we headed for cocktails, another gourmet dinner by Chef Philippe (including a beautiful sorbet), and then dancing with the “Alabama Contingency” as well as a few Brazilians. On Day 4, after yet another amazing breakfast (this time with lox and bagels for those of us who can’t get enough of this treat), we boarded our bus with an amazing tour guide named Polene. This was our second day with her and from then on we got up early to secure our spot on her bus. The charming village of Bergerac (yes, as in Cyrano de Bergerac) was our destination for the day. 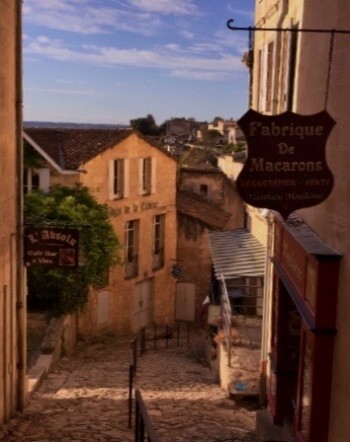 As we walked the cobbled streets and admired the square complete with a Bergerac statue in the middle, we noticed the picture perfect Bed and Breakfasts surrounding the square. I guess Bergerac’s love story sets the perfect location for these inns. We heard that poor Cyrano has lost his nose at different times to some pirating tourists, but on the day of our visit, he was all intact. 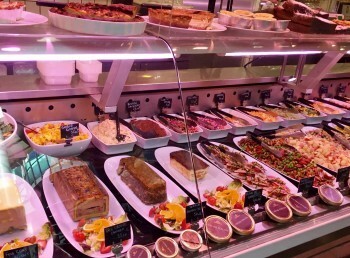 As we wandered up the cobblestone streets lined with wine and foie gras shops, we ended up at a Farmer’s Market replete with seasonal vegetables, fish, local wares, and, to our delight, a stand where we were treated to duck pate and foie gras. What a unique experience for those of us who can’t get it in the States. 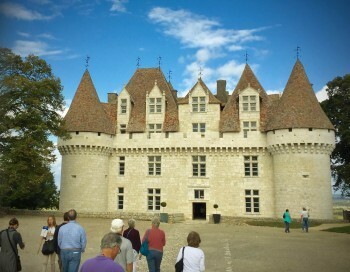 Bergerac wouldn’t be complete without a visit to Chateau de Monbazillac, The Chateau was built in 1550 with four turrets on each corner of the building as well as a moat and battlements. There is a small museum of old wine-related tools, rows of the “liquid gold” of Monbazillac’s famous sweet white wine, and on the main floor, an interesting exhibit in the SEM hall, a room of caricatures of French gentlemen and ladies during the 19th century. On the outside of the chateau, it was easy to imagine days gone by when those in the Chateau could gaze across the miles in the distance to detect approaching invaders. A special treat this day was lunch at the Michelin restaurant in a Medieval building in Old Bergerac. Restaurant L’Imparfait was classically French with beautifully presented regional food such as fois gras, oysters, caviar, and duck. We ate outdoors where we could admire the myriad of old buildings. Dinner that evening was served in the Blue Fox Café on the top deck. Our appetizer was a visually enticing array of four small tapas, including an oyster, a pungent cheese with jam, tomatoes, and Prosciutto with pickle. This was followed by a succulent Beef Wellington done to perfection. Once again, when it was time for dessert, we were given an assortment of four small taste treats—a chocolate tart, a chocolate covered strawberry, a cream puff and a Mai Tai shake. C’est Magnifique! Day 5 brought us along the Route de la Corniche Fleurie, named after the many flowers that line it. Some were still blooming even though it was fall. 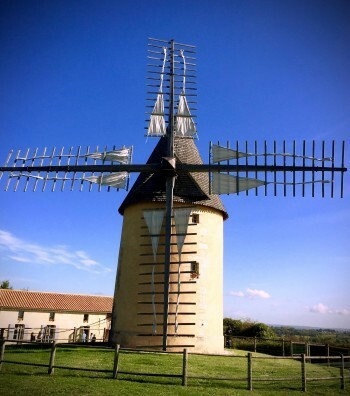 We were headed to Blaye, home of the Lansac mill, a working 1820s grist mill. Our first sight of this mill was the large windmill and sail-covered blades used to grind the flour that was used in this region. It was fascinating to watch the crude but still functional method used to grind the grain into flour. Outstanding views of the area abounded from the top of the hill where the windmill is located. Another stop in Blaye brought us to a UNESCO World Heritage site atop a steep limestone hill overlooking the Garonne River. This area dates back to the Romans and the seventh century where it has been used since that time for a variety of activities, including a parade ground, a home for monks, and a castle for several kings. We were awed by the ruins of a 17th-century citadel ordered by Louis XIV to be rebuilt to strengthen the existing fortifications at the Citadel of Blaye. Louix XIV’s goal was to protect the city of Bordeaux, located upstream of the estuary on the Garonne River. In addition, two other forts were built—one on an island in the center of the Garonne and one on the opposite bank. This set up crossfires to prevent enemies from sailing up to Bordeaux. One of the highlights of the day was the burger lunch. After so much gourmet French dining, an all-American burger served from the outdoor Blue Fox Café excited all of us, especially when accompanied by Pomme Frites. After all we were still in France. Following lunch, some of the group took an optional tour to Cognac to visit the Remy Martin distillery while others simply relaxed on the ship or took a horse and carriage ride around Bourg. For me, Day 6 was the highlight of our wine region tour. We were off to the famed Medoc region, Appellation Saint Julien. In 1855, when Napoleon III asked for a classification of the best wines of France to be labeled Grand Cru, 60 of the 61 total wines chosen were from the Medoc region (and after our tasting, I understood why). As our bus took us along this storied road, we saw the vineyards and chateaux of Margaux, Latour and Mouton Rothschild. We were fortunate to visit the Grand Cru winery, Chateau Lagrange, St-Julien, in the Medoc region. We learned the Medoc region is known for its Cabernet Sauvignon. The rocky soil is perfect for this grape. We were surprised to see how low the grapes hung on the vines but learned that the light-colored rocks retain the heat at night and thus lengthen the ripening time of these grapes. As we arrived at Chateau Lagrange, its splendor amazed us. Complete with a swan on the front lawn, a garden of roses, and a large lake in front of the chateau, we knew we were in for a treat. Of course our visit wasn’t complete until we sampled a Grand Cru 2008 as well as a 2014 Bordeaux. This wine is full of aromas of plum and tastes of dark fruits as well as bold tannins. Luscious! Or as Polene would say, “Ooh La La”! (As a side note, wines labeled Haut-Medoc are considered by the chateau as inferior to its main offering, just as second or third wines from the grandes chateaux may be labelled simply as Pauillac). 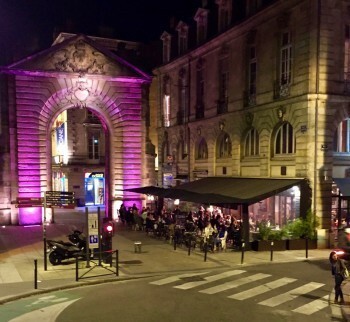 That evening we embarked on a night panoramic bus tour of Bordeaux. The city was awash with lights of many colors showing off the intricate architecture of the buildings, arches, statues, cathedrals, ferris wheels, long shopping alleys and streets, as well as the Ponte de Pierre Bridge (the one with the 17 arches). Bordeaux truly is a beautiful city. As we traveled along the streets of fine shops and restaurants in the inner core, Polene explained that the young people in their 20s to 30s that reside there are called “Bo Beaux.” She said she is a “Bo Beaux.” We all loved the story. Day 7 was left open for us to explore Bordeaux, “La perle d’Aquitaine,” on foot. We hopped on a tram that took us to the heart of Bordeaux’s Golden Triangle. The Church of St. Louis was one of our first stops. 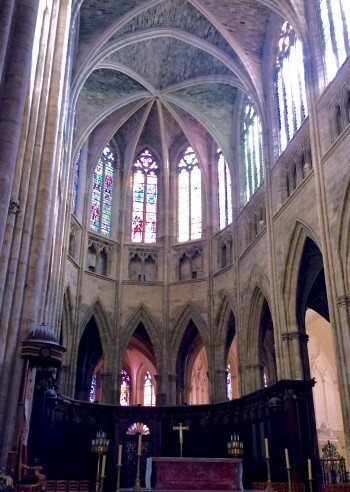 Its Gothic spires and architecture loomed over the area. Among the churches, we admired honey-colored buildings from the 18th century that make up a city core designated by UNESCO as a World Heritage Site. All of this sightseeing excited us for our next stop at Patissier David. We were impressed with beautiful, handmade chocolates, We later learned that the chocolate trade was brought to this region when banished Spanish Jews brought the art of chocolate making to France. However, the highlight was our sampling of the lightest cream puffs imaginable. The next stop was Chocolaterie Saunion, home of chocolate decadence. The colors of the fruit glacée under domed stands visually wowed us. The whimsical light fixtures amused us. The owner charmed us so much that one of the women in our group wanted to take him home. We continued meandering into a food court that overwhelmed us with the variety of elegantly prepared foods as well as fresh produce. As we were walking along some of the exclusive shopping areas, our guide told us to take a quick look inside one of the oldest restaurants in Bordeaux, Le Chapon Fin, a Michelin Guide-recommended restaurant founded in 1825. 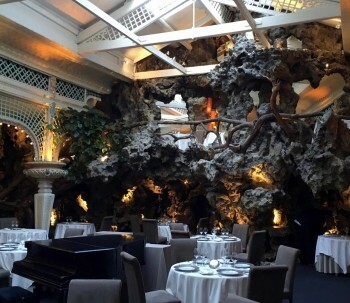 It was established in the slipstream of the French Revolution with a design combining numerous decorative plaster cast bas-reliefs, a fair amount of live greenery, and a substantial fake rockery feature (kind of a 1900s grotto décor). “Over the top” aptly describes this place. I’m adding it to my list of places I must visit when I come back. Our last night at the Captain’s dinner was bittersweet. Our journey was coming to an end. 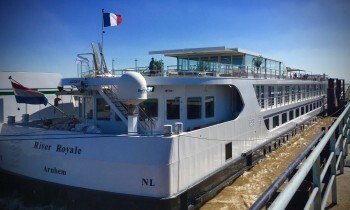 We all relished the wonderful opportunity we had had to explore the world-renowned Bordeaux wine region in all its glory aboard such a first-class operation. 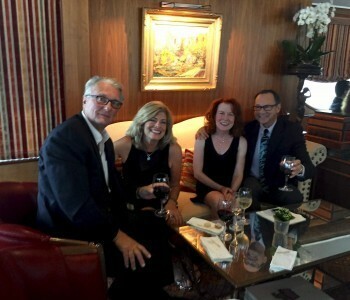 However, the night was still young, and after yet another impressive dinner, we had time for some brandy and dancing and the chance to talk with newly made friends about where we were going to travel on our next Uniworld cruise. Uniworld we will be back! To find out more about this Bordeaux cruise in 2016 or any other UniWorld cruises go to UniWorld's website.